Therapeutic massage improves your quality of life by lowering stress, treating muscle aches and muscle-related conditions, and restoring flexibility. 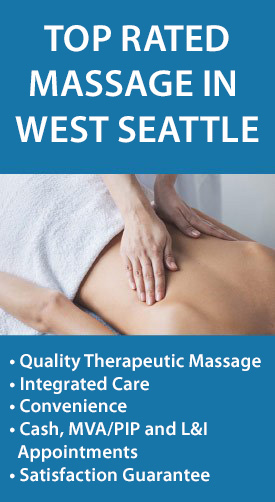 At Dreamclinic, our goal is to make massage therapy in West Seattle, Beacon Hill, Georgetown, Columbia City and South Seattle/Renton easily accessible for busy people. Conveniently located at SW Alaska St and 41st Ave SW with street and underground parking, book in conjunction with your physical therapy appointment or as a massage treatment alone. Our highly trained and caring professionals deliver a truly therapeutic experience every time, guaranteed. Street and underground parking available, garage entrance on 41st, just north of clinic entrance. Quality Therapeutic Massage from outcome-based, highly skilled therapists who we never stop training. Integrated Care – Our professionals team together for the best bodywork to speed healing & enable peak performance. Convenience –Make life simple with your best treatment team under one roof for sports massage, L&I workplace and motor vehicle accident/PIP injury recovery and restorative massage. Satisfaction Guaranteed – You’re in our care and we’ll take care of you. PIP/MVA Treatment: Typically 60 minutes of focused massage work to address car accident-induced injuries. L&I Appointments: Booked in 60 minute intervals to address workplace injury recovery. How do I book the massage? Go to https://taiwseattle.fullslate.com/, and choose the appointment slot you’d like. Taking a minute to register first saves time later. Upgrade a 60 to a 90 on us!